Remember, Scrooge: time is short, and suddenly, you're not here any more. A gentle clang of church bells and a minimalist film projector rendered in dots and lines – the sturdy ident for Cinema Center Films – welcomes viewers into the impassioned and often dark musical Scrooge. 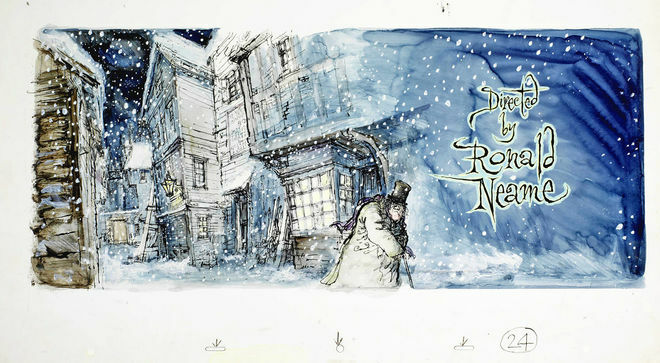 The 1970 film directed by Ronald Neame is one of countless renditions of Charles Dickens' universal A Christmas Carol, but the only one introduced with luscious handpainted title cards by illustrator Ronald Searle. Kenneth More credit overlay with illustration depicting Ebenezer Scrooge emerging onto a street in the evening. Note the scene references 4 and 5 at the bottom. As is often the case with Searle’s illustrations, the forms jump and squiggle into shape, the strokes loose and sprightly. In each scene, swaths of colour and life pour out, white snowflakes dotting the brush strokes. 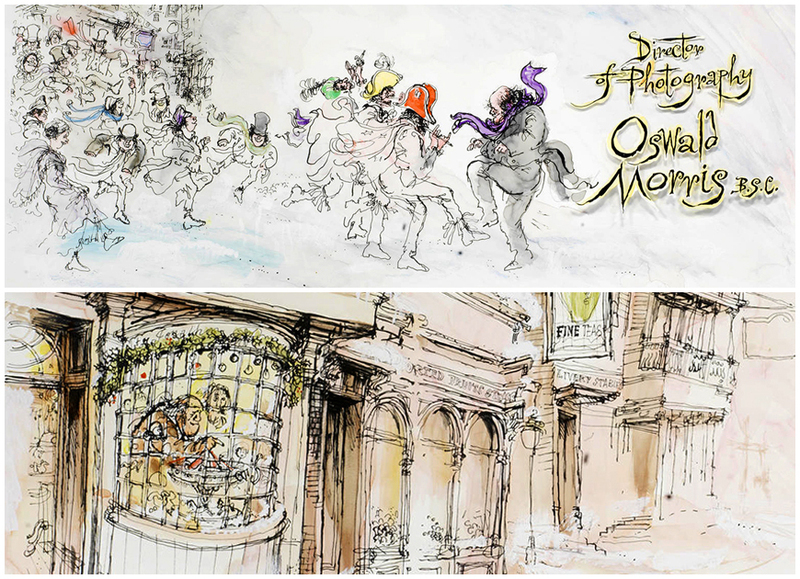 Original background illustrations and credit overlays by Ronald Searle, including some which were not in the finished sequence. Backgrounds are watercolour, gouache, pencil, pen, and ink on board. Credit overlays are gouache on celluloid. Searle’s style was one of invitation and of energy, each swirl of paint left open and visible, the lines lending themselves to allusion rather than definition. Paired with his lettering – a lanky, reaching serif – the aesthetic is one of honest vitality. 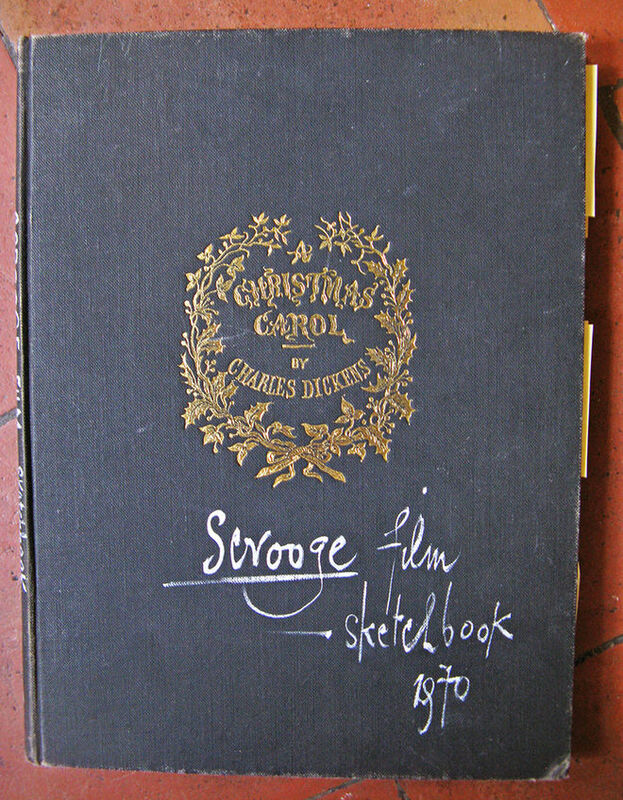 Undoubtedly, Searle was hired to produce the opening titles of Scrooge because of his previous work illustrating a book version of A Christmas Carol, published in 1961. It was likely a great success as almost immediately thereafter, he produced illustrated editions of both Great Expectations and Oliver Twist. 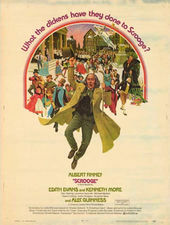 Initially, however, Searle had intended to lend his hand to an animated film version of A Christmas Carol, scripted in 1959 by Christopher Fry and cast by his then-wife, journalist and editor Kaye Webb. According to Kaye’s biographer Valerie Grove in her 2010 book, So Much To Tell, the negotiations for a Searle-illustrated film were long. Kaye approached top actors such as Charles Laughton, Alec Guinness, Robert Morley, and John Gielgud to do the voices. Peter Brook was approached to direct. Contracts were drawn up – "£200 a day for Laughton, 200 guineas for Gielgud, £100 for Robert Morley." But as is wont to happen, problems arose: agents’ fees, equity deals, storyboard changes, availability. Sadly, the project fizzled out and the illustrations of Ebenezer and friends were not to be seen on film – that is, until 1970, when Neame took up Scrooge,with Alec Guinness in tow, and Searle’s illustrations at the fore. The film was produced by Cinema Center Films, a small studio under CBS Television’s umbrella which pumped out 30 films in five years and finally closed in 1972, not once turning a profit. Scrooge came to be nominated for a BAFTA Film Award, a Golden Laurel Award, four Oscars, and five Golden Globes. 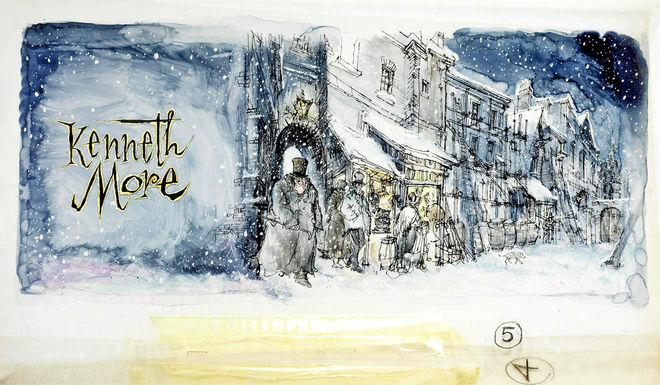 Ebenezer Scrooge walks down a street alone in the snow, in watercolour, gouache and ink on board, with a credit overlay, gouache on celluloid. The numbers at bottom are a scene reference – 24. This is the final illustration in the opening titles. Our thanks to Matt Jones for his assistance with the materials featured in this article.